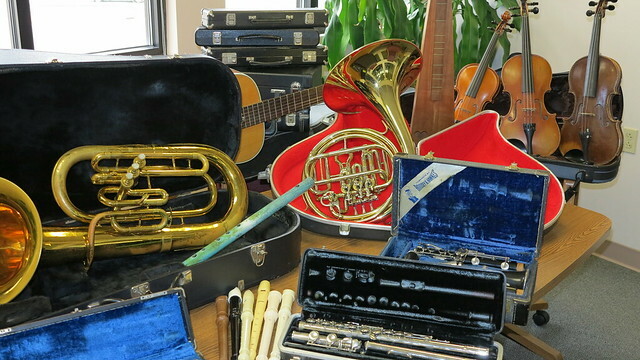 Thanks to generous support from MPBN listeners, and other donors in Maine, The Gifts of Music has an inventory of instruments available. Upon request from a music educator TGOM will work with instrument technicians to get an instrument cleaned and restored to optimal playing condition for “gifting” to a deserving student. Please use this instrument application form and send it to The Gifts of Music for consideration by the Board of Directors. The Gifts of Music is working to expand access to music education for Maine youth by providing instruments and we appreciate the support of our donors, and music educators like Lee Smith. Instrument “gifting” is done on a first-come, first-served basis as our instrument inventory and restoration funds allow. While The Gifts of Music is appreciative to receive donated, used instruments, our greatest need is cash donations to help the organization clean and repair the instrument to optimal playing condition for the student. We also accept cash contributions to support our music scholarship, grants and Y Music accounts. Unfortunately because of limited storage space and resources TGOM is unable to accept donations of acoustic pianos at this time. The Gifts of Music would like to acknowledge and thank Maine Public Broadcasting for supporting our efforts to collect used instruments! In the event there is a surplus of instruments, or donation of a particularly high-value instrument, The Gifts of Music may sell the instruments at auction, with proceeds being returned to designated funds. The Gifts of Music also asks for a return of instruments that go unused so we may “re-gift” them. When TGOM receives donated instruments from the public, they are evaluated by our repair technicians, and repaired for “re-gifting” as money is donated to the instrument refurbishing fund. TGOM is appreciative of the generosity and skill donated by instrument repair technicians Glen Sargent of Second Wind Music and Joe Shaw of Bangor Brass and Woodwind for making these donated instruments ready for music educators, for their students and programs.